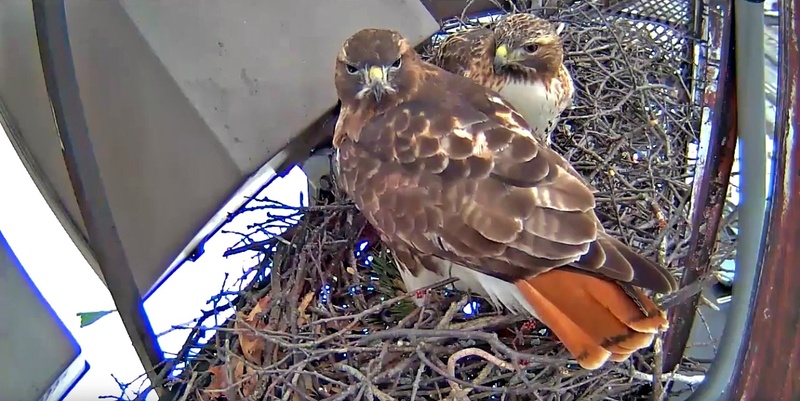 After nearly a year of uncertainty following the death of Big Red's former mate Ezra, we've all wondered if and when Big Red would find a new mate, and whether they might nest again on one of the Red-tailed Hawk cams. Thankfully, as the months have progressed, it has become clear that she's formed a bond with a new companion and that they are investing in nestbuilding on the tower opposite Fernow Hall (the "original" site that was live streamed back in 2012). Nothing is ever a sure thing, but we are cautiously optimistic that they will attempt to nest at the Fernow site this year. Back in 2012, we worked with the viewing community to name Big Red's former mate Ezra, and we would like to continue that tradition. You can submit a name until February 25 using the form at right. After the submissions end, five potential names will be chosen from the submitted names and you'll be able to vote on your favorite choice. Thanks for taking the time to help name Big Red's new companion!